“The Hand in the Back of the Room” by Dr. Byron L. Ernest is a book that needs to be put in the hands of every educator in the world. In this book, Dr. Ernest shares his research study on relevancy in the classroom. Is it important for students to see relevance in what they are studying? Is relevancy more impactful on higher performing students, or students who struggle in the classroom? Dr. Ernest provides many gold nuggets throughout this book. On page one he reminds us that education must evolve with society to remain viable. He goes on to say there are three worlds that students learn in: the school world, real world, and virtual world. His research shows that providing real world relevance facilitates greater learning for students. This study uses agricultural sciences as a means to provide relevance. The author shares that the students greatly benefitted from the experience of working alongside working professionals. This book goes in-depth into the research project, similar to a dissertation or thesis. The study is laid out, literature is reviewed, and conclusions are drawn. As a former educator, I recognized many of the theories in education (Vygotsky’s Constructivist Theory, Gardner’s Multiple Intelligence Theory). Dr. Ernest’s findings, that relevance in the classroom is critical, fit right in with other theories and research from the past. The author provides recommendations for educators, including using their agricultural science programs to supplement learning of other science concepts, teacher collaboration of best practices and offering professional development for implementing teaching science with relevance. 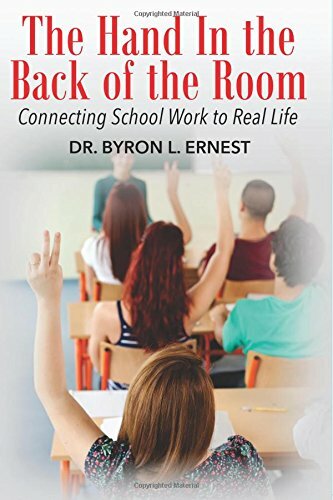 I highly recommend “The Hand in the Back of the Room” by Dr. Byron L. Ernest for all educators, not just science teachers, although I think science teachers would greatly benefit from reading this research study. As a former educator, I know the challenge of covering all the curriculum, while making the material engaging and relevant for each student. Dr. Ernest does a great job of helping us all see how important agricultural science is in the study of science in general. I wish I had read this book a decade ago when I was in the classroom!